I felt compelled after a visit to the rebuilding of the towers and the 9/11 memorial in New York City last year to write a poem. 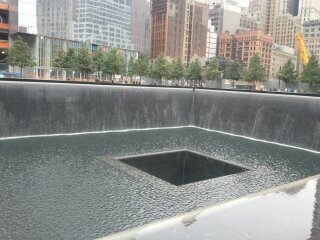 The reflecting pools, as well as the rest of the memorial, are a profound landmark. Here is a small writing, post visit. Lovely poem, my friend! I am on my way to share this link to my FB page. Have a great day! Thank you, Blaze. You’re too kind. It is my pleasure, Sirrah. Two of the old gang have already responded. I like when that happens!